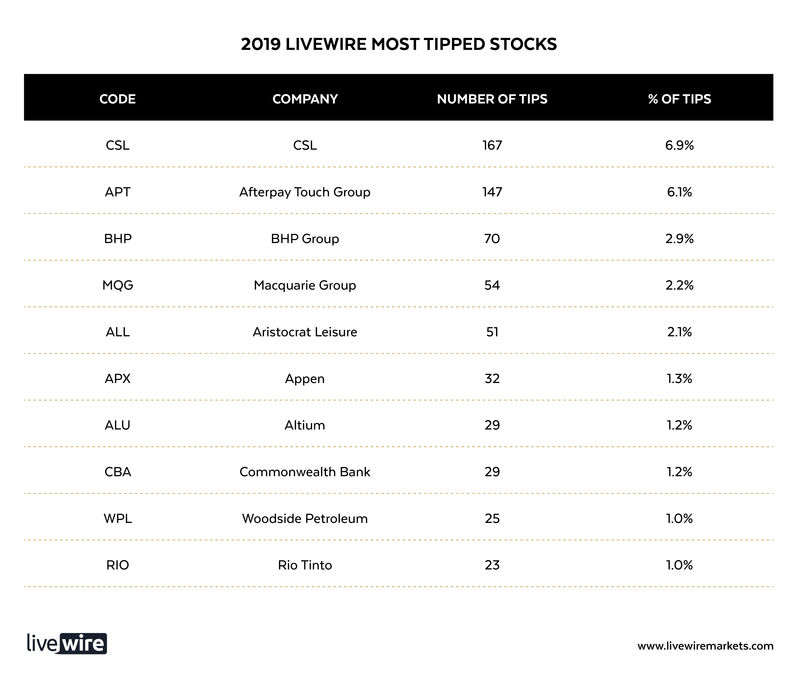 Equity indices everywhere were in the red last year, yet the three most tipped stocks from the 2018 Livewire reader survey, Afterpay Touch, CSL and BHP, all finished well in the black. They gained (excluding dividends) 107.7%, 31.0%, and 15.8% respectively, or 52% on average. While the order has changed, the top 3 this year comprises the same stocks as last year. In addition, the conviction across this group has increased, with the aggregate share of votes increasing from 10% to 16% (from 2,500 participants). Can lightning really strike twice? Let’s see what the fundies have been saying about these three stocks, as well as the new entrants to this year’s most tipped stocks list. Back in late 2017, Bell Potter included CSL in a shortlist of their ten ‘most favoured stocks for 2018’. They have also backed it up again for this year in this wire saying that: ‘the global growth in plasma volumes is expected to be around a solid 8% per annum for the foreseeable future and, in addition, the group is planning to launch new products from its very extensive Research and Development portfolio”. This time last year, Richard Coppleson nailed it with his nomination of Afterpay as his top pick for Livewire’s 2018 outlook videos, saying: “I think it is an absolute screamer. It’s got a billion dollar market cap, they’ve got 40% EPS growth this year, 50% EPS growth next year, and multiples going beyond that”. The stock price had quite the journey since then, tripling between April and August, then halving as the market stumbled in Q4, yet still finishing the year up 108% to be the top performer on the ASX200. The price has consolidated more recently, and readers are clearly confident that Afterpay will resume the meteoric rise that has taken it from microcap to midcap in under 3 years. After five years of declines, the miners turned back up at the start of 2016. The contrarians were followed by the growth managers, and more recently the income specialists are making the case for the sector. “In terms of the gems that we see now in the market, it is in a place that people haven't really seen income from in the past, and it's resources. If you look at BHP and Rio, they're both sitting on fully franked yields of over 7% now. Rio has just done its second off-market buyback. BHP is doing a major off-market buyback now, as well as the big special dividend in January. The resource stocks are now on fairly healthy margins from where commodity prices are. Iron ore prices really haven't fallen in the last six months, and given the Australian dollar has, that's just only improved their margins”. Like the three stocks above, Macquarie was also on the list last year and bucked the market trend to finish up for the year. Readers are backing it again for 2019, and the stock has had several managers write positively on it on Livewire in recent months. "We continue to have a positive view of Macquarie over the next year, especially relative to other financials. Recent company updates suggest they continue to perform ahead of expectations and we believe their guidance for the full year remains quite conservative". In ‘what Benjamin Graham would say about this market’, Hugh Dive from Atlas Funds Management focused on Macquarie as a stock that would appeal to the father of value investing himself. Marcus Bogdan at Blackmore also landed on Macquarie as one of “4 stocks to consider after Red October”. While the first four stocks on this list were also on last year’s list, the rest of this list, including Aristocrat, are new entrants. And also unlike the first four, Aristocrat went backwards last year so doesn't have momentum on its side. Several contributing managers are positive on the stock. A few months back, Charlie Aitken singled out Aristocrat as an opportunity in his wire “When rotation goes too far” listing several fundamental drivers and catalysts as to why he believes Aristocrat “at the current share price levels offers a compelling opportunity”. Stuart Jackson at Montgomery ran the ruler over the stock in ‘Aristocrat diversifying beyond machines’, and Steve Johnson included the stock in a theoretical portfolio designed to be recession-proof as well as property-proof in this recent wire. "I was frustrated back in September when profitless companies were surging. I wrote for Livewire that a portfolio made up of high-flying stocks like Wisetech, Xero, Appen, Altium and Afterpay was trading at more than 15 times revenue and more than 480 times earnings. The performance of some stocks – knowing their underlying business model and prospects – was inconceivable so I called a peer in funds management whom I know had purchased some of these stocks. I couldn’t understand how he was holding them even after they had doubled or tripled for him. I couldn’t get a valuation even at the price he’d bought them for. At that point I knew we wouldn’t have to wait very long for some sort of correction. When reputable and smart people collectively start doing dumb things, the party is almost always close to over." "We also like Altium (ASX: ALU), an Australian-domiciled owned public software company that provides PC-based electronics design software for engineers who design printed circuit boards. Unusually for tech companies, it actually has a PE (around 40 times)! Its underlying business is PCB software - basically green boards that all the chips are put on when you buy tech goods. Altium makes the software that people use to design these boards. Historically they've had a huge piracy problem; they have not been able to get their users to pay them, particularly in China. However, that problem is turning around as piracy is falling the world over. That means they have re a huge growth potential not because their software is penetrating any further, but that people are starting to pay. That sort of a structural change is a positive for their business which I think warrants their valuation." I've never thought of the biggest stock on the market as a contender for the top performer in percentage gain terms, but the market can be an unpredictable place! “Banks have maintained their dividends in 2018 despite one-off expenses associated with the Royal Commission. While $1.5 billion in pre-tax legal and remediation costs seems large, after tax it is relatively small in the context of approximately $30 billion in annual post-tax profits for the big four banks. When averaged across the 10 years of the Royal Commission review period, it represents less than 1 per cent of annual bank profits over that time. Although we do not predict near-term dividend increases from the banks, at current prices they are all trading on strong dividend yields and below average price-earnings (PE) ratios. The fact that none of the banks cut dividends in 2018, when they could easily have used the Royal Commission excuse, suggests they are reasonably confident they can maintain current levels”. He looked at how rates, real wages, de/regulation, household debt, bank credit, and housing prices have turned mostly from tailwinds into headwinds. He was also careful to point out that he thought prices were more likely to oscillate in a range than collapse, and that total returns would be driven by dividends. This wire triggered some passionate debate, in response to which Michael penned a second wire to clarify his view, which was another good read. “Despite buying back ~10% of its ASX listed register for ~A$2.9bn via an off-market buy-back last month, we think RIO will return in the new year with another, potentially even larger off-market buy-back. RIO has recently announced three asset sales totaling ~US4.5bn, the proceeds of which we expect will be returned to shareholders. The largest of these is its interest in the Grasberg mine in Indonesia worth US$3.5bn. While this is subject to a number of regulatory approvals it is expected to close in 1H19. The one caveat for RIO is there is talk that they may bid for a minority interest in Teck Resources’ copper assets in Chile. This could cost ~US$2bn which would reduce the value of the potential buy-back”. There are some very interesting, lesser-known small-to-midcaps further down the spreadsheet. If you are interested in being the first to see the follow-up wire covering them, please hit the follow button below. And if you've found this piece useful, please like, comment or share it with investing friends. Thanks for your support, and all the best for a prosperous 2019.
for ALU why is "piracy falling the world over"? anyone care to share any insight? There seemed to be a chorus of joy when XRO, APT, ALU and APX tanked post September last year - was it because these people missed the boat - what about these business's superior business models, skin in the game and offshore focus? The too late to the party brigade dropped the ball - missing Aust/NZ Small guys who think big and execute with determination. This group will press on because they pursue comparative advantage principles in an international arena. incredible - Consensus can be right sometimes! Oliver, piracy on Altium is decreasing because they moved to a SaaS service model rather than a traditional software purchase model. Apparently their software was being widely used across China without anyone paying for it, where as they are starting to see migration to the SaaS platform now as the old product ages. Uday Cheruvu from PM Capital here, replying to Oliver Minchin's question on Altium. The reasons for decreasing piracy are not price-related but the fact that updates to systems have become more important to users. Updates allow designers access to newer features for designing electronic boards which reduces design time. This strategy of frequent updates which improve functionality is assisting to drive down piracy. Secondly, Chinese companies are exporting their designs overseas. This also forces them to buy licences in order to send authenticated designs to customers.